Manufacturer of a wide range of products which include stranded rope conductor, copper rope conductor and paper covered copper rope conductor. We are offering our clients with the best Stranded Rope Conductor. Conforming with the defined parameters of the industry, these offered conductors are manufactured by us in different sizes and specifications. Furthermore, these conductors allow electricity flow with little resistance of solid. Maximum Dia 40 mm, Cross section area 630 sq.mm. its has stranded/flexible and extra flexible according to clients application and requirements. Packaging Details: Standard packing/ Wooden Reel/Customized.Pallets etc. We are offering our clients with the best Copper Rope Conductor. Conforming with the defined parameters of the industry, these offered conductors are manufactured by us in different sizes and specifications. Furthermore, these conductors allow electricity flow with little resistance of solid. 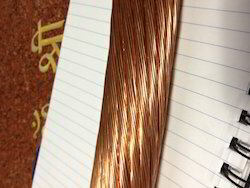 We are a highly acclaimed name in manufacturing and supplying best quality Paper Covered Copper Rope Conductor. These are available as per buyer requirements at highly affordable rates. 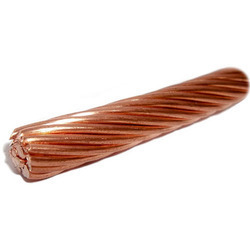 Stranded rope conductor, Flexible Rope and extra flexible Rope conductor made from Bare copper and tinned plated copper wire, Range up to any cross section area up to 630 sq.mm or 40 mm Dia. Packaging Details: Standard Packing, coil/wooden reels/customized reels/ customized packing on wooden pallets for export and For domestic standard safe Packing.